Stone Chariot One of the most intriguing architectural marvels at Hampi is the Stone Chariot. This masterpiece is in fact a small temple which was meant for taking out the deities on a traditional procession. Some still believe that the rock wheels of the chariot are actually functional. 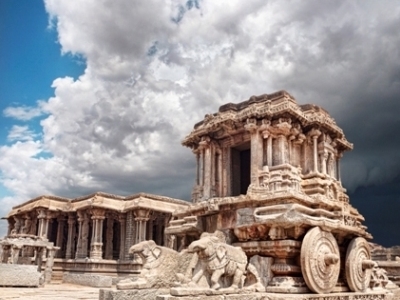 Here's the our members favorite photos of "Monuments near Hampi". Upload your photo of Stone Chariot! Connect with Mallika Tuli and Anup Kumar who have already visited Stone Chariot.